For as long as man has looked up at the heavens, he’s pondered one question: Are we alone in the universe? While the answer remains unclear, there’s a tonne of research being conducted to determine just what life-sustaining planets beyond Earth might exist — and what they might look like. There’s no shortage of imaginative renderings and fiction about what such worlds may entail, as well. Countless movies and works of literature envision fantastical worlds full of complex life forms and spacecraft that travel at physics-defying speeds. In EA Games’ latest installment of the Mass Effect series, Mass Effect: Andromeda, game designers bring a variety of hypotheticals to life. 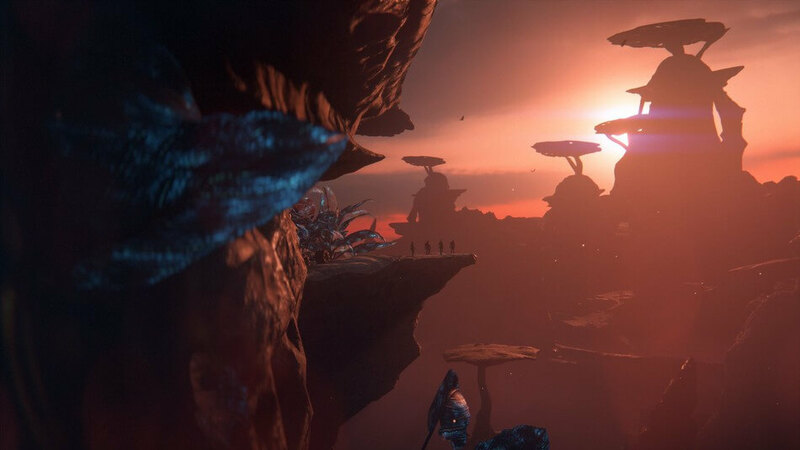 The game’s plot revolves around humans’ search for a new, habitable planet; each of the game’s Golden Planets represents a literal world of possibility explorable via immersive, stunningly visual gameplay. Digging into the reality of what a life-sustaining planet may look like is equally as fascinating as science fiction. Dr. Alberto Conti, astrophysicist and innovation manager at Northrop Grumman, says that humans are just at the start of their search for life in the universe. “In the last few years, we have learned that each star around us in our own galaxy and in all galaxies in the universe has at least one planet. We are talking about billions of planets in our own galaxy alone,” Conti explains. What does it take to sustain life? A serendipitous combination of factors led to the existence of life on our pale blue dot. At its most basic level, the “habitable zone” refers to a planet’s distance from its parent star and the presence of liquid water. Planets that are too close to a star, explains Conti, will be too hot, and water will only exist in gaseous form; on the flip side, any water present on planets that are too far away from their star will be frozen. Earlier this year, NASA announced that a series of seven roughly Earth-sized planets — the TRAPPIST-1 system — had been discovered orbiting a “cool” dwarf star just 40 light-years from Earth (“practically in our neighborhood,” says Conti). The discovery is tantalizing for the scientific community, particularly because three of the planets in the TRAPPIST-1 system appear to fall within the habitable zone. What exactly these planets look like, however, remains to be seen. Cutting-edge instruments and techniques let astronomers and organizations like NASA conduct this type of research. The “wobble” method, which measures the movement of a star as a planet orbits around it, and the transit method, which examines a star’s “dip” in light when a planet crosses its face, are two of the most common ways astronomers detect exoplanets. Both are exercises in precision and patience, says Conti. NASA’s Keplar spacecraft, launched in 2009, pioneered the transit technique — and it’s observed around 170,000 stars over the course of its primary mission. To date, it’s also located more than 4,700 planet candidates, a handful of which fall in the habitable zone. Of its discoveries, the planet Kepler-186f is perhaps the most “Earth-like” in terms of radius and where it falls in the habitable zone of a star. Unfortunately, at 560 light-years from Earth, the planet is too faint and far away for more extensive study, at least at this time. In 2018, the NASA James Webb Space Telescope, a project with which Conti is currently involved that’s being touted as the successor to the Hubble telescope, will be capable of analyzing the atmosphere of worlds such as the three promising planets surrounding TRAPPIST-1. This means we may be on the cusp of learning much more about these exciting discoveries and their potential to sustain life. All this isn’t to say that the discovery of life on other planets is imminent. Conti believes that the use of tools like the JWST will inevitably lead to the discovery of watery planets — perhaps ones entirely encased in ice or oceans.